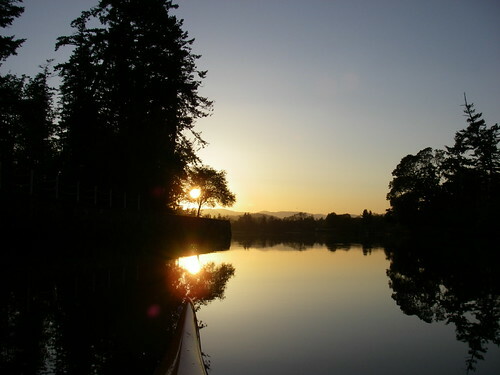 I went out for a nice solitary night paddle starting at the Victoria Canoe and Kayak Club's clubhouse and ending up near Esquimalt's west bay. As I put in I had a few spectators asking my about the stuff on the deck and where I was headed. Where I was headed was wherever the Tillicum bridge let me. I had a look and it was clear I would just slide under the bridge toward Victoria. The eelgrass was bent in an ebb current, but I was nearing slack. 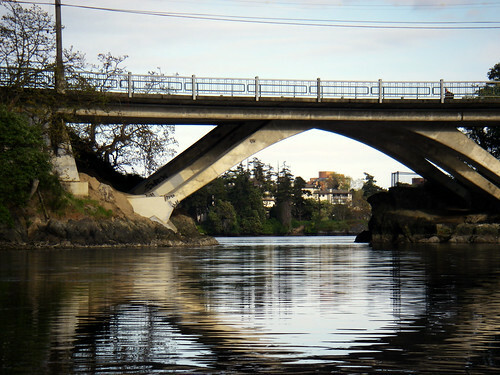 My first capsize in a kayak was under this bridge, whose current can whistle through at up to 7knots. I worked my way down to Jutland, which seemed much closer now than it did when I paddled for the first time. 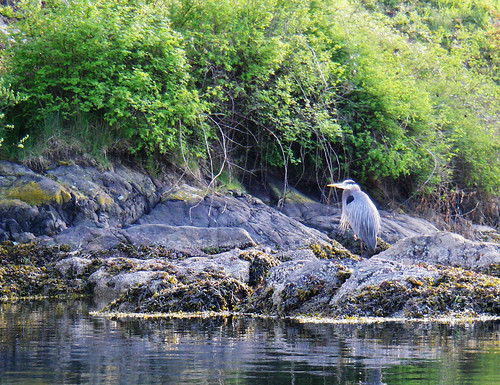 Lots of herons on the rocks and the tide kept getting lower and lower. I paddled under the bridges and into Victoria's inner harbour for the first time. It was pretty simple to navigate, despite the traffic. I noticed a strobe flashing as I came around the rocks, which signaled that a float plane was about to take off or land. The sun was glaring fantastically off the water as I headed due west. I found a little place to watch a float plane take off. Just as the plane left, Victoria clipper called in to traffic to leave the harbour. Esquimalt was looking inviting, and I wanted to keep going, but I was running out of light. 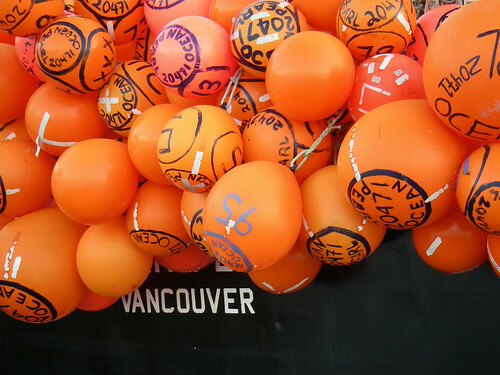 I turned around just past Songhees and headed back to the launch. 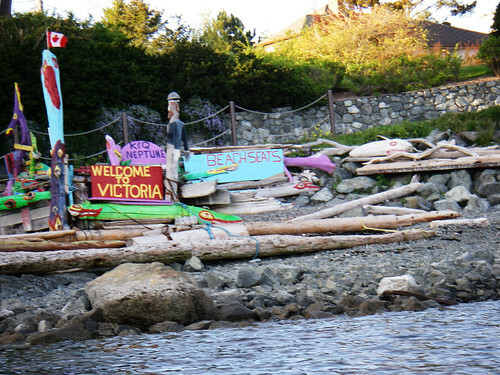 The pic above is a little piece of Victoria's eccentric art community. everything in that kids park is covered in psychotic, teeth bearing, technicolor monsters and bizarre interpretive Canadiana. I was treated to a beautiful golden sunset on the way back. 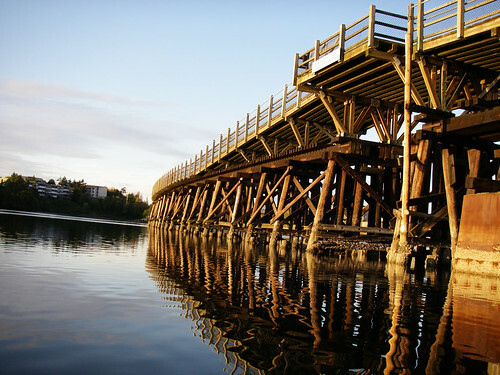 The Selkirk trestle glowed in the warm sun, and the water just became more and more calm as the wind died off. Birds were setting up in the trees for the night and the entire gorge was still. Here's what the water looked like at the end of the trip.